Ninh Binh | Ninh Binh hotel, Hotel in Vietnam | Vietnam Hotels - Best prices guaranteed! Located as far as 100 kilometers south of Hanoi is Ninh Binh province, the south extreme of the Red River delta. Inside the province is the grandiose Tam Diep Mountain, connecting the North and the South. The province stretches from the Northwest mountainous area to the delta, thus being called a half mountain half-plain area. 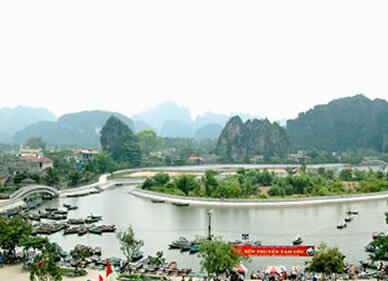 In particular, Ninh Binh contains 3 main kinds of topography: limestone mountains with fascinating caves & grottoes, the delta raised by Red River Silt, and a coastline with the length of 18 kilometers, enlarging the province area by 100m2 per year. Besides limestone caves and grottoes, Ninh Binh is also popular for the first imperial capital of Vietnam, from 968 to 1010, under Dinh, Le and Ly dynasties, which has resulted in its cultural tourism potential. In addition, Tam Coc-Bich Dong and Cuc Phuong national park within the province are desirable destinations for tourists.